We’re in a situation that calls for action to give the next generation a fighting chance. Please set up a meeting with your U.S. representative or their staff next week, while your representative is in their home state. This action alert is not asking you to sign a petition or send an email. We are appealing to the citizen-activist inside you. It’s not hard and we will walk you through the steps. It’s a fact that most Members of Congress are not paying sufficient attention to the risk from nuclear weapons. There are concrete actions your U.S. representative can take to reduce this risk. Please ask them to do it. We are working with a powerful ally in Congress: Representative Adam Smith, Chair of the House Armed Services Committee has introduced a bill to promote the health and safety of all families by establishing a U.S. policy of No First Use of nuclear weapons. Smith is seeking cosponsors and PSR has joined forces with several allied grassroots organizations for In-District Advocacy Week. Congress must take action to reduce nuclear weapons dangers! Set up a meeting for next week, April 22-26, which is In-District Advocacy Week. Congress is on recess and it is quite likely that your U.S. representative is back home “in-district.” What better time to focus their attention on reducing nuclear weapons dangers? Step 1) Find your representative’s website. Googling should work, but as a backup, use house.gov/representatives. Step 2) At your representative’s website, find the listing for the district office nearest you, and get the phone number. Step 3) Give their Congressional in-district office a call during business hours, identify yourself as a constituent, and ask for a meeting with your representative sometime between April 22 and April 26. Tell the staff you want to reduce nuclear weapons dangers, and you want the representative to support H.R. 921 on No First Use of nuclear weapons. As a fallback, meet with district staff if you are unable to get a meeting with the representative—as meeting with local staff is another excellent way to convey your message and potentially cultivate a relationship with staff that will help your advocacy efforts. Step 4) Negotiate with in-district staff until you arrive at a meeting time that will work. This may happen on email. Step 5) Notify us at PSR that you’ve landed a meeting! Email Martin Fleck at mfleck@psr.org. Feel free to reach out to Martin for advice about your representative, and if you experience any issues scheduling a meeting or have any concerns. Step 6) Prior to the meeting, consult PSR Nuclear Weapons Abolition Legislative Tracker, psr.org/nwatracker, look under H.R. 921 to see if your representative is among the 25 current cosponsors. If so, then be ready to give your representative a heartfelt THANK YOU, and look through the other legislation at the legislative tracker to see what you’d like your ask to be. Step 7) If your representative is NOT an H.R. 921 cosponsor yet, then print out the No First Use Fact Sheet to give to your representative, and prepare for the meeting by studying PSR’s No First Use Talking Points. Step 9) Important: after the meeting, visit hub.psr.org to report in to PSR about your meeting. Step 10) And send a thank-you card to the staffer who helped you set up the meeting, or if you met with the congressperson, send a thank-you message through their website. 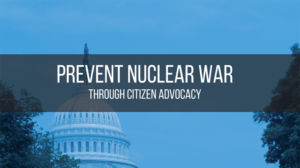 Thank you, citizen-advocate, for stepping up to the plate to ensure your U.S. representative takes action to reduce nuclear dangers. PS: If you are not 100% sure which Congressional district you are in, you can find which Member of Congress represents you by visiting callmycongress.com and entering your zip code.